Provide your information for a free quote and our sales executive will contact shortly. Provide your details and we'll schedule a demo for you! Backing up all of your organization’s data is a big job. In today’s world data travels between a variety of devices and the risk of losing data on even one device can mean disaster for your business. 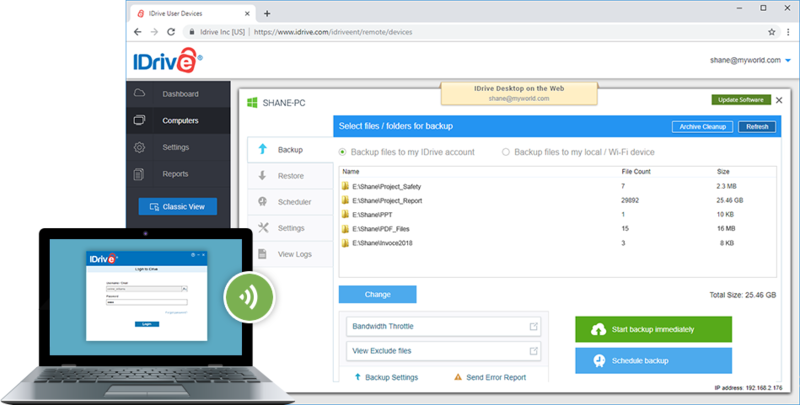 From backing up your servers to making your data accessible across a network of computers, smartphones and tablets, IDrive eases enterprise-level backup from beginning to endpoint. Backup Windows and Linux servers with ease. Includes SQL, Exchange, SharePoint, VMware, Hyper-V, Oracle and Office 365 Mailbox backups at no additional cost. Your data is encrypted prior to backup with 256-bit AES encryption. Private key encryption ensures only you can access your data. Save time and bandwidth on lengthy uploads with our express shuttle service. Backup support for desktops, laptops, mobiles and servers. Restore multiple file versions of backed up files. Easy installation and setup, takes only seconds. HIPAA-ready, to protect your clients and your business. Allow users to access IDrive by signing in to a central identity provider. Deploy the thin client application that has limited GUI, on your computers and perform backup, restore or manage settings, via the Dashboard. Manage backups of all your remote computers with robust reporting tools with near real-time response from the centralized console. Through the 'Computers' tab view all the devices attached to your account in one screen. Remotely manage your computer settings, its backup set and schedule. The 'Settings' tab gives the power to globally update settings. Change settings and press the 'Propagate' icons to instantly push those updates to all devices. Legal Hold is a process which allows the admin to block a user account. The user will not be able to access his account, but Admin can actively access the account and download data. Admin can add or invite users, edit, block, and delete users. In addition, make other users as Admin from the Dashboard. Admin can lock particular settings for a user or a group of users. The users cannot modify those settings, till the Admin unlocks it. Makes it easy for your school, your faculty, and your students to protect their most critical data. IDrive enabled Alchemy to switch their backup costs from capital expenditure to operating expenses. As a result, Alchemy saved time and money, while giving their customers peace of mind that their data is secure in the cloud. With IDrive, Discover Los Angeles found an easy to implement, cost-effective and reliable backup solution.